…EXCITED FOR – Thanksgiving with my hubby’s family…can’t wait to snuggle those nieces and nephews. …MISSING – my sisters and brother and their little munchkins. …LISTENING TO – The Parent Rap…funny stuff if you have kids. …TRYING – to not lose my patience when kids are doing the things kids do so well. 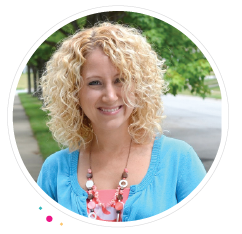 …PLANNING – some awesome cool giveaways for the month of December for YOU! You are going to love the ones I have so far. …WORKING AT – getting on some sort of schedule for cleaning, family, baking, blogging…these late nights are killing me. …WAITING FOR – a shopping day with my hubby…can’t wait to do some Christmas shopping with him for our monsters. …ENJOYING – my BOGO Starbucks holiday drink…although I kind of wish I had gotten the peppermint mocha instead of the gingerbread. 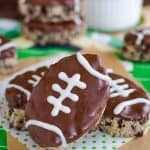 Chocolate rice krispie treats made with brownie mix and mint chips. Place the butter and marshmallows in a large saucepan over medium heat. Stir until melted and smooth. Stir in the powdered brownie mix until dissolved. Add the Krispies and stir until completely coated. Spoon the mixture into prepared dish. Gently press down. Let set. In a microwave safe bowl, heat the chocolate chips and shortening for 30 seconds. Stir. Repeat until melted and smooth. Spread over the top of the rice krispie treats. Sprinkle with the Andes mint chips. Let set before cutting. 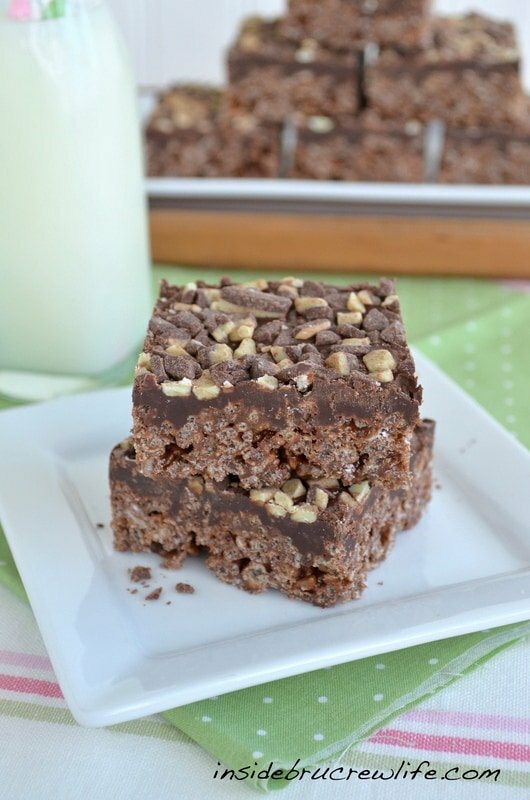 Brownie krispie treats… For reals? I can see why they mysteriously end up going missing, I’d be right there with you! 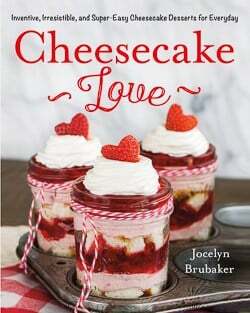 I’d love it if you came over to my Sugar & Slice Sunday Link party and link these bad boys up! I send things to work with my hubby too…or just take them with me to work to pawn off on others. If I didn’t I wouldn’t be able to fit through the doorway! Time management is the one thing I am setting out to conquer this next year…haven’t figured out how, but that’s what I need to do! Any ideas? One thing (among many) that we have in common. Our serious love of Krispie Treats. 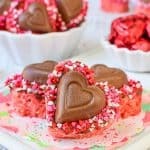 OMG these look awesome, love the brownie mix. Mmmm. We do have so much in common:-) Love that!!! The brownie mix made these so chocolatey and delicious!!! Oooh, I got the skinny peppermint mocha today (aaaaaand, I might have also snuck some of my husband’s gingerbread) – so good! And these rice krispie treats? With the brownie mix and mint chips? They are calling my name!! LOVING the BOGO at sbux!! 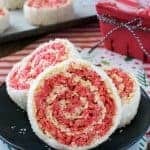 such a great deal 🙂 black friday makes me nervous so i never go haha, maybe i’ll shop online and make these yummy treats! Cheers to the Starbucks holiday cups! Peppermint mocha all the way. 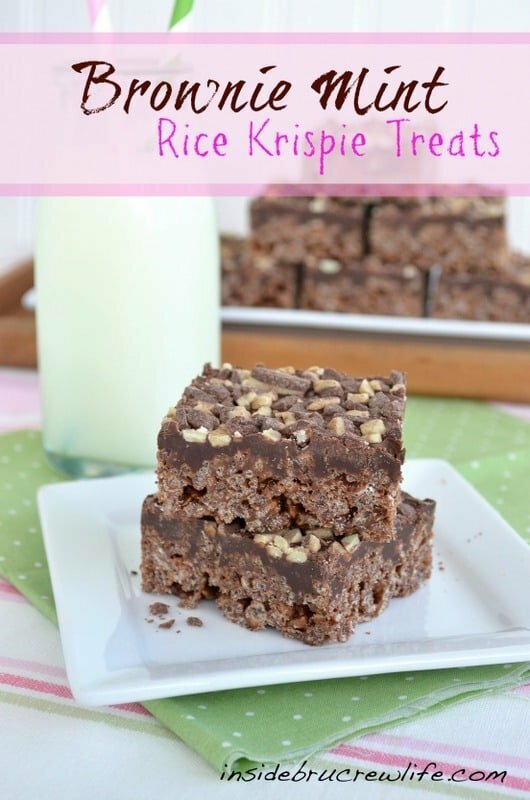 It would be even better with one of these fab rice krispie treats to accompany it! Love this post since it gives us a little more glimpse into your day-to-day life/thoughts, which is always fun. =) And these rice krispie treats look soooo good! 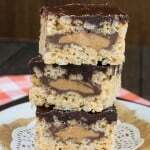 I’m usually not a fan of rice krispie treats, but these look amazing. I love the chocolate mint flavors you gave them. Hard not to love anything with chocolate and mint! I have to send baked goods with my husband to work, too, otherwise I eat way too many! These sound incredible! Jocelyn, these look delicious! I am a closet Rice Krispy fiend. I don’t know why I never make them, but I seriously love them–and I am loving this brownified version as well. So gooey and chocolatey! 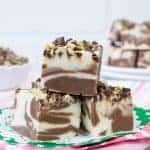 i adore mint chocolate treats! i can’t wait to try these! 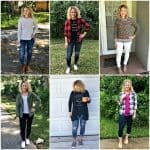 I like your list, I could relate to so many of those!!! I’m such a purist with Rice Krispie treats but I don’t know why???? I should be eating these instead! Love chocolate and mint! “Rice Krispie treats are the one thing I can eat all day long” – you and I alike, sister!!!! I can never get enough of them. And Jocelyn… when mint and chocolate/brownies are thrown into the mix.. wow… you’d have to literally PRY the pan out of my hands! Congrats!! That is amazing! And again– no surprise 🙂 Your photos are incredible!!! I love all things chocolate, so I know I would love these cookies. Please submit them to our Holiday Cookie Recipe Swap at http://thedomesticatedprincess.blogspot.com/2012/11/holiday-cookie-recipe-swap-week-1.html. 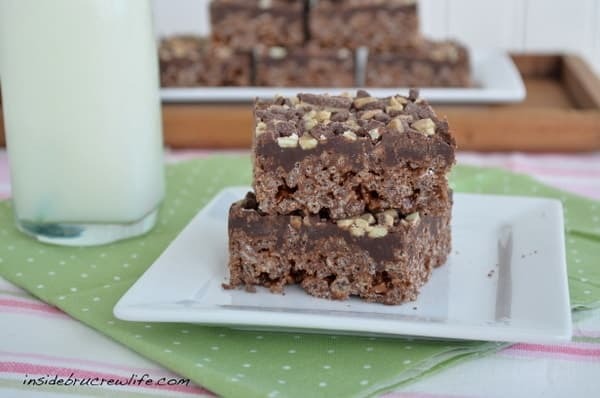 Now that the NBA playoffs are going on, I’m thinking of making some “cocoa krispies”@ “Basketballs” treats. all I need is chocolate flavored marshmallows, and a large size “Norpro”@ meatballer to give them their perfect round, shape. These will also be ideal for HS and colledge basketball pep rallies.